I was recently in a group of homeschoolers who were all decrying how terrible textbooks are. The worst. Not a normal or natural way to learn. Dry and boring. Let me tell you a secret. Textbooks can actually be great. Textbooks get a bad rap. Deservedly so much of the time. 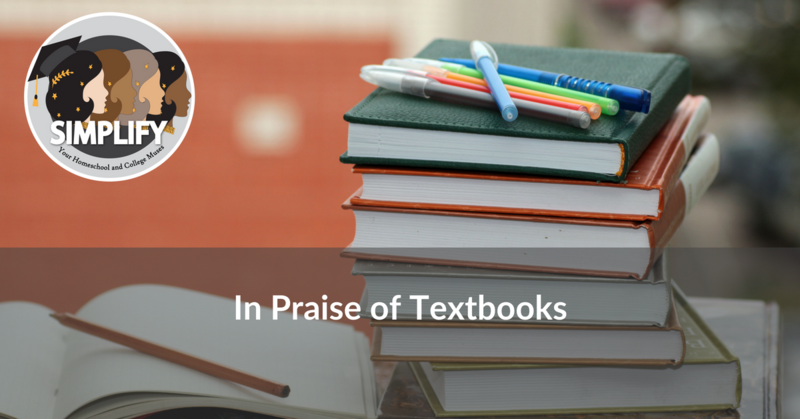 Many textbooks really are boring, poorly organized, or generally slapdash. Most are written for the public school market. Demands by school boards can make them unfairly biased. The pace at which publishers now put them out means a serious lack of quality for many textbooks. However, there are gems out there. There are some vintage textbooks that are brilliantly done. Some textbooks are published by smaller publishers and were labors of love by their authors, trying to get a better textbook out for schools, perhaps aiming for the private school market, which is sometimes more creative or picky in their choices. Other textbooks come from big publishers but are so popular that they’ve been revised and honed instead of scrapped for another new subpar product. One of the problems with avoiding textbooks is that we often end up with a piecemeal version of a subject as a result. You can’t cover all of American history or a survey of astronomy or much of any broad subject through individual titles, historical fiction, and activities or experiments without ending up with gaps. One of the things we’ve been moving away from in our whole education system, both in homeschooling and in public schools, is establishing a base of knowledge. However, it’s important to do in order to grow the critical thinking skills kids need. Textbooks are one great way to help us do that. As your student gets to high school, you may need more textbooks than ever before. One of the benefits for advanced students is that you can often use AP or college textbooks, many of which are of higher quality than other textbooks. Sometimes, you just need a solid textbook. This is not to say that you need a textbook all the time. In the early grades, you definitely don’t, though if your students like them, that’s okay too. As students advance in their education, they will likely encounter more and more textbooks. They should eventually know how to read and use one to learn. I give you permission to use them if they work for you. You haven’t failed your kids. Quite the opposite. Next StoryDo You Get What You Pay For?